Theme parks have a way of letting everyone let their hair loose, relax and have fun. We’ve listed the best theme parks in Asia that offer you immersive and enjoyable experiences and help create lasting memories. This ocean theme park is a mini-world of pure adventure for all members of the family. Featuring some of the most electrifying rides, you must try the Hair Raiser to get a first-hand feel of a floorless roller coaster ride, or hang upside down in mid-air on The Flash. But what’s really special about Ocean Park is its unending number of marine and animal showcases. Housing the Grand Aquarium, the largest aquarium in the world, you will meet exotic sea creatures from the sting ray to sharks and little sea-horses in this under water dome. Another main attraction is the Amazing Asian Animals exhibit; a sanctuary for Pandas, Chinese Alligators and Otters. With all the shows covered under the entry fees and an app to help you go around the park, this family-friendly park is easily one of the best in Asia. Best time to visit: Year round destination. Visit during the festive season to witness special shows and events. This 2 bedroom apartment in Causeway Bay is ideal for anyone looking for a comfortable stay in the heart of HK. The amenities of the condo combined with a full kitchen and living area makes this the ideal spot for a family vacation. The Ocean Park is ~20-30 minutes via MTR and less than 10 minutes by road. You are never far away from a fun family activity when you stay here: Central Star Ferry, the Peak tram and Lan Kwai Fong (well-known for its fun pub / club scene) are all within easy reach. Enter this real-life fantasy world to meet some of your favorite animated movie characters. A treat for children, Universal Studios at Sentosa Island has a bundle of rides, street entertainment and shows to keep everyone entertained the entire day. You can experience the destructive forces of a hurricane, fight the Transformers and witness death-defying stunts performed in the movie ‘The Lost World’, all at Universal Studios. The special effects movie show, the Sesame Street Space Chase is also a must-try adventure ride that will bring the entire family together to fight the bad guys in space. With a total of 24 movie -themed rides, the Hollywood Walk of Fame and a mock-up of the New York Skyline, the Universal Studios at Sentosa Island provides good competition to its counterpart in Hollywood. Best time to visit: Visit on a weekday, anytime round the year to avoid the long queues. Unique, tranquil and private 2 storey house located within a condominium. The large living spaces allow you to spend a relaxed time after a hectic fun packed day at Universal Studios. The MRT station is just 5 minutes away. Enter this life-sized dreamland to meet some of your favorite animated movie characters. To experience the magical world of Harry Potter, try out The Hollywood Dream, a roller-coaster ride that goes in reverse or become a Flying Dinosaur from the Jurassic Park, a crazy ride that’s definitely not for the faint hearted. The Minion Park, SpiderMan and The Terminator are other zones within the park with their own special effect movie shows, adventure rides and shopping centres. Showcasing even more rides and experiences than the Universal Studios in Singapore, this action-packed park will surely give you the boost of adrenalin that you’re seeking. You can also shop for some unique and exclusive souvenirs and collectables to take back with you. Best time to visit: Visit on a weekday, and avoid the Summer and Winter Breaks for shorter queues at the rides. Conveniently located a 12-minute walk from Nankai Namba Station and a 2min walk from the subway Daikokucho, this apartment has room for the entire family. Getting to Universal Studios is easy. With a TV and a free pocket wifi, you are equipped to entertain the family. Witness the world of Legos come to life at the Legoland in Malaysia, an experience that kids will not forget in their lifetime. This theme park has over 70 rides, shows and adventure activities that can be enjoyed by the entire family. Enter the Lego Kingdom to be king for a day and explore your magnificent castle or get set for a splash between forgotten volcanos at the Dino Island. With separate sections dedicated to water sports, indoor activities, kids rides and games, there’s a whole lot of rides for you to cover in just a day. Tastefully furnished 3 bedroom apartment with swimming pool and a whole lot of clubhouse facilities for an enjoyable time with the family. Legoland is a short 15 minute drive away. With rides and attractions based on popular Hollywood Animation characters, this enormous theme park has 5 different sections that offer a complete entertainment experience. A treat for kids and families, the park is filled with 27 fun rides including the Dreamworks indoor park, Dark Tower, Roller Coasters and Water Rapids. Also, don’t miss out on the live dance performances and multimedia based theatre shows that are bound to leave a lasting impression on the kids. The best part is your kids get a photo –op with characters from The Smurfs and Madagaskar, you’re sure to create memories for a lifetime. And finally, let’s not forget the friendly, supportive staff who are always around to help you around the venue. Best time to visit: Visit any time after the summers to avoid the heat and have a pleasant trip. Located in the gorgeous Dubai Marina overlooking sumptuous beaches, the Jumeirah Palm Island and the yacht dotted waters, this beauty of an apartment will be the perfect base for you to enjoy your trip to Motiongate and Dubai. Splash around in the outdoor pool, relax in the sauna or whip up a storm in the well-equipped kitchen. Motiongate is around 20-25 minutes by road. With its vibrant atmosphere, you’re already set for a fun time when you enter Tokyo, Disneyland. You’ll need at least a day to catch the best rides and action at this 115 acre theme park. If you’re here with family, it’s best to complete rides that are unique to this park first. The Haunted Mansion, Big Thunder Mountain and Monster’s Inc. Ride & Go Seek are the people’s favorite, so try and catch them early, before the queue gets long. There are also regular parade shows and special events designed to create a lasting impression on the kids. What’s more, the guest rooms are well-maintained and readily available if you plan to stay back for another day of fun. Best time to visit: Between April and May, just before the rains start. Cozy apartment located close to supermarkets, restaurants and a perfect base for Tokyo Disney resort and Tokyo tours. Buses to the Maihama station is just 6 minutes and you can reach the JR Tokyo station in 13 minutes! This well-maintained, picturesque theme park is known as Seoul’s very own Disneyland. Ranked as one of the best theme parks in the world, you’ll find some unique, innovative rides at Everland. Even the staff are always smiling and go out of their way to entertain their visitors. The Ferris Wheel doesn’t disappoint with its view across the valley from atop, and the Safari ride takes you deep into the forest for a close view of red pandas, lions and polar bears. A great place to bring the family, this complete theme park, set amongst lush mountains will leave you cheerful and exhausted by the end of the day. Best time to visit: Visit anytime from late October to Mid-November to experience the prettiest season of the month. Enjoy stunning night views with your family from the private terrace of the pent house located on the 42nd storey. Close to a major bus station with easy access to metro station and the down town area. The host can help with reservation, direction or any tour assistance. With the highest water slide in the world, this amusement park is for family members willing to go the extra mile when it comes to thrill seeking. With over 80 attractions across 80-acres, you can expect an action-packed day at Sunway Lagoon. It’s best to cover the water rides first before going to check the wildlife and other activities to save time. Apart from the water slide, the upside down Tomahawk and Pirate’s Revenge Ride have also earned a reputation of their own. It’s bound to be a fun-filled afternoon creating memories for life. 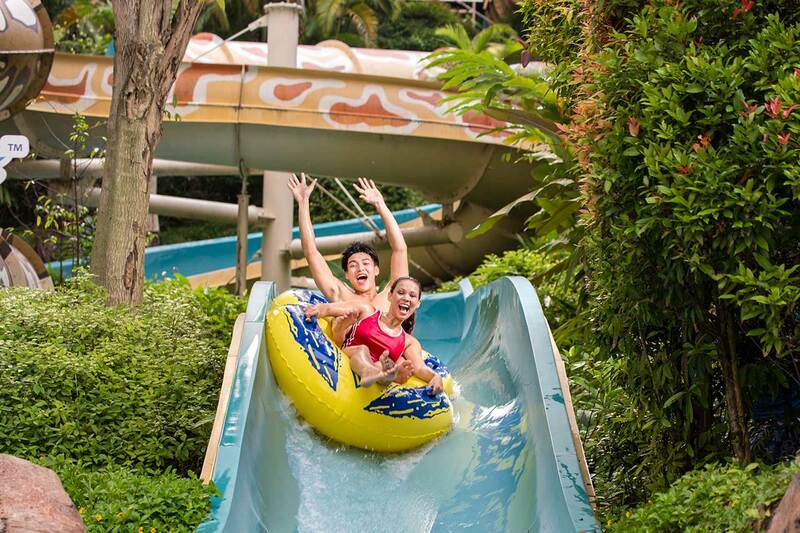 Best time to visit:Anytime from June to August or between December and Jan are the best time to visit Sunway Lagoon. This beautifully furnished 692 square feet serviced apartment has 2 bedrooms and is walking distance to KTM Subang Jaya Station & LRT. The Sunway Lagoon is approximately 13 minutes by road and 35 minutes by subway. Previous Early birds, make your bookings for December holidays!